Insect herbivores possess a diverse and abundant gut microbiota that may influence plant growth in nature. The application of plant beneficial bacteria to improve agricultural production and soil quality has long been of interest. Thus, these insect-associated microbiota have the potential to be developed into effective bio-fertilizers. The bacterium, Enterobacter ludwigii, was isolated from the regurgitant of field-collected tomato fruitworm, Helicoverpa zea. The bacterium can be secreted by the insect onto tomato seeds during fruit feeding and is also commonly found in the soil. We applied E. ludwigii to germinated tomato seeds and measured tomato plant growth and productivity under controlled greenhouse conditions. Since there are often trade-offs between plant growth and plant defenses, we examined whether the E. ludwigii-mediated faster growth corresponds with weaker anti-herbivore defenses. When E. ludwigii was applied to germinated tomato seeds, the plants exhibited faster root, shoot and hypocotyl growth, and produced more fruits and seeds than untreated control plants. The plants treated with bacteria exhibited the same activity levels of two key enzymes involved in anti-herbivore defenses, polyphenol oxidase and peroxidase, and induced the same levels of mortality and growth inhibition in H. zea larvae as untreated plants. Thus, our results demonstrate that the application of E. ludwigii to seeds can promote tomato plant growth and yield without compromising anti-herbivore defenses. Plants live in a microbial milieu; some are beneficial, while some are pathogenic. Microbes that can stimulate plant development and fitness are termed plant growth-promoting bacteria (PGPB). The use of PGPB to improve agricultural production has long been of interest (Bashan 1998) and their use as bio-fertilizers has recently gained more traction as part of sustainable agricultural practices (Javaid 2010; Mouhamad et al. 2017; Megali et al. 2014). Particularly, growing numbers of studies have described the potential use of bacteria isolated from soil (Mayak et al. 2004), rhizosphere (Madhaiyan et al. 2010; de Souza et al. 2013) and even honey (Zhang et al. 2015) to enhance plant growth. Various bacterial genera have been reported to exert beneficial effects on plant growth and fitness (Glick 2012), including Enterobacter (Berger et al. 2013), Kluyvera (Son et al. 2014), Bacillus (Zhang et al. 2015), and Kosakonia (Berger et al. 2017). The bacterium Enterobacter ludwigii was recently isolated from the regurgitant (gut and salivary juices) of the tomato fruitworm, Helicoverpa zea (Wang et al. 2017). Helicoverpa zea larvae that were orally inoculated with E. ludwigii induced higher plant anti-herbivore responses when feeding on tomato plants than larvae that were not inoculated. This was due to bacteria-mediated changes in the expression of H. zea salivary proteins. The study demonstrated an important impact of gut bacteria on plant-herbivore interactions. When herbivores feed on plants, they secrete some of their gut microbiota onto plant tissue via regurgitant and saliva. Some of these secreted bacteria can elicit physiological responses in plants and positively or negatively influence the quality of the plant for herbivore growth (Shikano et al. 2017). Interestingly, in contrast to the heightened induced defenses of tomato leaves when fed on by E. ludwigii-inoculated H. zea, the direct application of E. ludwigii onto wounded tomato leaves suppressed anti-herbivore defenses in the leaves (Wang et al. 2017). In a previous study, a strain of E. ludwigii, isolated from the rhizosphere of wild Elymus tsukushiensis on Dokdo Island (South Korea), was shown to produce the plant growth-promoting factors indole-acetic acid (IAA) and siderophores, which improved pepper plant growth (Son et al. 2014). Moreover, grass (Lolium perenne) seeds inoculated with an E. ludwigii strain isolated from field-grown L. perenne in Valdivia, Chile, gained more biomass compared to non-inoculated grasses (Shoebitz et al. 2009). This E. ludwigii strain served as a biological control agent to inhibit the development of the fungal phytopathogen, Fusarium solani (Shoebitz et al. 2009). Indiragandhi et al. (2008) discovered that bacterial isolates from the guts of larval diamondback moths (Plutella xylostella) have growth-promoting effects on tomato and canola plants. Therefore, in the present study, we hypothesized that the strain of E. ludwigii isolated from larval H. zea regurgitant may also enhance the growth and fitness of the host insect’s food plants. An important drawback of PGPB-mediated faster plant growth has been reduced plant inducible defenses (Megali et al. 2014, 2015; Bobadilla et al. 2017). Rapid plant growth is often accompanied by a cost to the plant’s defenses (Züst and Agrawal 2017). Züst and Agrawal (2017) recently proposed a theoretical unifying framework for growth-defense trade-offs as a means to study a plant’s allocation of limiting resources. According to this framework, plants must allocate a finite pool of resources to numerous plant functions to maintain their biological functioning, including growth, reproduction, and resistance to herbivores and pathogens. There are many examples demonstrating the negative relationships between plant growth rates and the strength and diversity of defenses (Myers and Sarfraz 2017). For example, Arabidopsis plants with higher concentrations of glucosinolates that act as defenses against herbivores exhibited slower growth rates (Paul-Victor et al. 2010). Helicoverpa zea larvae often feed on the fruits of tomato plants. As H. zea larvae regurgitate and defecate during feeding, copious amounts of gut bacteria will most likely be deposited in the fruit, and hence on the seeds (Burkett et al. 1983). Thus, in the present study, we applied E. ludwigii to the seeds of tomatoes. 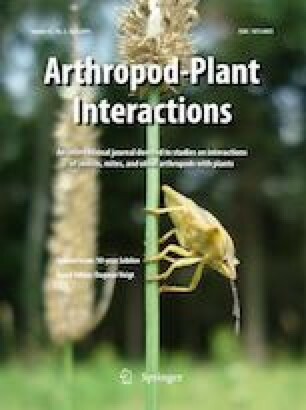 Since the direct application of our E. ludwigii strain to tomato leaves suppressed anti-herbivore defenses, we hypothesized that suppression of the plant’s defenses would divert the plant’s resources, which were allocated for defense, to the plant’s growth and thereby increase plant growth rate and yield. Our results clearly demonstrate that E. ludwigii enhanced tomato plant growth and yield; but contrary to our hypothesis, this bacteria-mediated plant growth promotion was not associated with suppressed plant defenses. Our study shows that by considering ecological plant-insect-microbe interactions, we may be able to identify agriculturally beneficial microbes from insects. Tomato (Solanum lycopersicum) seeds of cv. Better Boy and Micro Tom were used in this study. We used Better Boy to measure plant growth rate and chemical anti-herbivore defense parameters. Better Boy has an indeterminate growth type and is one of the most widely grown hybrid tomato varieties in the United States. We used Micro Tom to measure plant yield because it has a dwarf-determinate growth type. All plants were grown in a climate-controlled greenhouse at 25 °C with a photoperiod of 16L:8D at Penn State University (University Park, PA, USA). Helicoverpa zea eggs were originally purchased from Frontier Agriculture Sciences (Newark, DE, USA). Colonies were maintained in the laboratory on a wheat germ and casein-based artificial diet in a growth chamber set at 25 °C (day) and 18 °C (night) with a photoperiod of 16L:8D. Enterobacter ludwigii isolated from the regurgitant of field-collected H. zea larvae by Wang et al. (2017) was used in all experiments. For long-term storage, the bacterial culture was maintained at − 80 °C in 2 × YT liquid media with addition of 50% glycerol. The bacteria were incubated in a rotary shaker overnight at 200 rpm at 27 °C. Subsequently, the bacterial culture was centrifuged at 5000×g for 10 min. The bacterial pellet was then re-suspended with double distilled water, and adjusted to a density of 109 colony-forming units (CFU) mL−1 (OD600 = 0.1) for use. All seeds were surface sterilized with 1.8% NaClO followed by 0.02% Triton-X for 15 min, rinsed with double distilled water twice for 10 min, and allowed to germinate in a Petri dish on wet filter paper. To compare the difference between bacteria-treated plants and untreated plants, germinated seeds were soaked in a bacterial suspension or double distilled water for 3 h, then individually transplanted in 10-cm plastic pots containing sterilized (autoclaved) professional growing mix (Sunshine Mix 4 Aggregate Plus). Plants were maintained in a climate-controlled greenhouse at 25 °C and 16L:8D. Tomato cv. Better Boy was used to measure plant growth parameters. Three trials were conducted at three different times. Plants in trial 1 were grown during May to June of 2016; plants in trial 2 were grown during May of 2017, and plants in trial 3 were grown during June of 2017. In trial 1, we measured root and hypocotyl lengths. In trials 2 and 3, we measured the lengths and weights of the roots, shoots, and hypocotyls. In trials 1 and 2, plant growth measurements were taken at 11 days after germinated seeds were sown in 10-cm plastic pots (11-day-old plants). We grew 24 untreated and 21 E. ludwigii-treated plants in trial 1, and 10 plants for each treatment in trial 2. In trial 3, plants were fertilized with 2 g of Osmocote Plus 15-9-12 (Scotts, Marysville, OH, USA) 10 days after germinated seeds were sown in individual pots. On the same day as fertilization, we supplemented the E. ludwigii-treated plants with a soil application of E. ludwigii consisting of a 5 mL bacterial suspension (109 CFU mL−1). We grew 22 untreated and 21 E. ludwigii-treated plants in trial 3. Five millilitre of water was applied to the soil of control plants. Fifteen days later (25-day old plants), the plant growth parameters were measured. Tomato cv. Micro Tom was used to evaluate the influence of E. ludwigii on productivity. The plants were maintained for 106 days (December 2016 to March 2017) and the experiment was terminated when plants stopped producing new fruits; we grew 20 plants for each treatment. Germinated seeds and seedlings were treated with the bacterial suspension or water, and plants were fertilized as described above for 25-day-old plants. The total number of flowers and ripened fruits was monitored for both treatments; all seeds were then collected and counted from the harvested ripened fruits. Tomato cv. Better Boy was used to test the effects of bacterial treatment on plant anti-herbivore defenses; 25-day-old plants, which were in the 5–6 leaf stage, were used. Plants were grown at the same time as the plants used in trial 3 of the plant growth experiment, and were treated with bacteria and grown as described above. To induce an anti-herbivore response in the plants, one mid-5th instar H. zea was placed in a clip-cage (2 cm in diameter) on the second youngest fully expanded leaf. The larvae were allowed to feed for up to 3 h to consume the entire leaf area inside the cage. The larvae and cages were subsequently removed. Induced anti-herbivore responses in tomato plants peak at approximately 48 h after damage occurs (Constabel et al. 1995). Thus, after 48 h, we collected a 50 mg sample of plant tissue from the damaged leaf, immediately froze the sample in liquid nitrogen and stored it at − 80 °C. The samples were used to assess the activities of two key anti-herbivore defensive enzymes in tomato. The remaining tissue from each damaged leaf was used to measure H. zea larval growth and mortality, as described below. Empty clip-cages were placed on control plants, and leaf samples were collected as described for H. zea-damaged leaf tissue; 20–31 plants were used in each treatment group (E. ludwigii-treatment by H. zea damage-treatment). The excised tissue from each plant was equally divided into two plastic cups such that there were two replicates for each plant. One 2-day-old larva was weighed to the nearest 0.1 mg and placed in a 30 mL plastic cup with the excised leaf tissue. Cups were lined with 1% agar to prevent leaves from desiccating. The larvae were fed for 5 days. Since there were two replicates (larvae) per plant, mortality was recorded as 100% (two dead larvae), 50% (one dead larva), and 0% (both larvae alive) for each plant. Larvae that survived for 5 days were weighed and the weight gained was calculated. The enzymatic activities of peroxidase (POD) and polyphenol oxidase (PPO) were measured according to Felton et al. (1989) with some modifications. Frozen leaf tissue was collected and ground in a 2-mL tube using a GenoGrinder 2000 (Spex SamplePrep, Metuchen, NJ, USA). The ground sample was then homogenized immediately in 1.25 mL of extraction buffer (0.1 M potassium phosphate buffer, pH 7.0) containing 5% insoluble polyvinylpolypyrrolidone (PVP) and maintained on ice for 5 min. The suspension was then centrifuged at 11,000×g for 10 min at 4 °C. The supernatants were used as the enzyme sources for both assays. To measure POD activity, 5 µL of supernatant was mixed with a substrate consisting of 10 µL of 3% hydrogen peroxide and 190 µL of 3 mM guaiacol in 0.1 M potassium phosphate buffer. The change in absorbance was measured at 450 nm for 5 min. To measure PPO activity, 5 µL of supernatant from each sample was mixed with 200 µL of a substrate consisting of 3 mM caffeic acid in 0.1 M potassium phosphate buffer, and the change in absorbance was measured at 450 nm for 5 min. The total protein content in tomato leaves was determined by Bradford assay for each sample, using a dilution series of bovine serum albumin (BSA) to produce a standard curve. Plant growth, productivity, and protein content measures were analyzed using Student’s t-test to compare differences between bacteria-treated and untreated control plants using SPSS (version 19.0; SPSS Inc., Chicago, IL, USA) software. Plant enzyme activities and insect mortality data were compared between treatments using a general linear model (GLM) with MINITAB (Minitab Inc., State College, PA, USA). Treatment of germinated seeds with E. ludwigii enhanced all of the growth parameters of 11-day-old tomato plants cv. Better Boy (Fig. 1A, B). In trial 1, E. ludwigii-treated plants had significantly longer root length (t1,43 = −3.349, P = 0.0020) and hypocotyl length (t1,43 = -4.674, P = 0.0001) than untreated plants (root length = 20.07 cm and 16.41 cm, respectively; hypocotyl length = 4.3 cm and 3.35 cm, respectively). In trial 2, the mean root length of E. ludwigii-treated plants was significantly longer than the roots of untreated plants (Fig. 2A: 23.36 cm and 19.31 cm, respectively; t test, t(18) = -2.631, P = 0.0170). The root weight of E. ludwigii-treated plants was much heavier than untreated plants (Fig. 2B: t(18) = − 3.227, P = 0.0050). 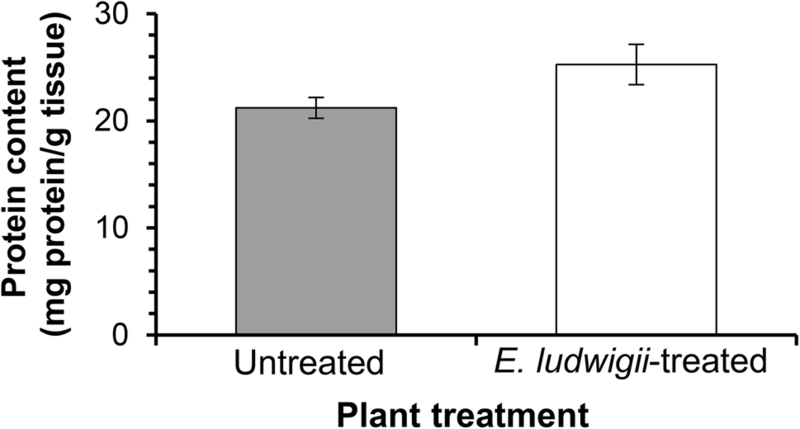 Also, shoot length of E. ludwigii-treated plants was longer than untreated plants (Fig. 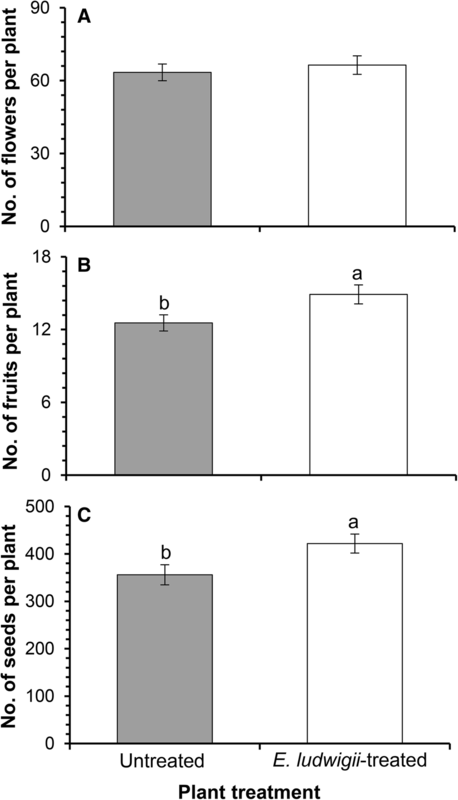 2C: t(18) = − 3.428, P = 0.0030) and shoot weight of E. ludwigii-treated plants was greater than untreated plants (Fig. 2D: t(18) = − 6.435, P = 0.0001). Lastly, the hypocotyl length was longer in E. ludwigii-treated plants (Fig. 2E: t(18) = − 2.441, P = 0.025) and the weight of the hypocotyl was heavier in E. ludwigii-treated plants than untreated plants (Fig. 2F: t(18) = − 6.103, P = 0.0001). Bacteria did not make a significant difference in the mean root length of 25-day-old plants (Fig. 2G: t(41) = − 0.886, P = 0.3810), possibly because the plants were grown in small pots, such that the growth of their main root was restricted. However, the root weight was heavier in E. ludwigii-treated plants (Fig. 2H: t(41) = − 6.242, P = 0.0001). Also, shoot length of E. ludwigii-treated plants was longer than untreated plants (Fig. 2I: t(41) = − 3.642, P = 0.0010) and consequently weighed more (Fig. 2J: t(41)t(41) = − 7.161, P = 0.0001). The length (Fig. 2K: t(41) = − 1.493, P = 0.1430) and weight (Fig. 2L: t(41) = − 0.885, P = 0.3810) of hypocotyls were not significantly different between 25-day-old E. ludwigii-treated and untreated plants. Compared to untreated tomato plants, tomato plants cv. Micro Tom treated with E. ludwigii produced significantly more fruits (Figs. 1C, D, 3B, t(38) = − 2.288, P = 0.0280), which resulted in a higher production of seeds per plant (Fig. 3C, t(38) = − 2.257, P = 0.0300). This higher yield occurred despite the fact that bacteria-treated plants did not produce significantly more flowers per plant (Fig. 3A, t(38) = − 0.584, P = 0.5630). The mean protein content in the leaves of tomato plants cv. Better Boy treated with E. ludwigii tended to be higher than in untreated plants, though not significantly (Fig. 4, t(41) = − 1.94, P = 0.059). 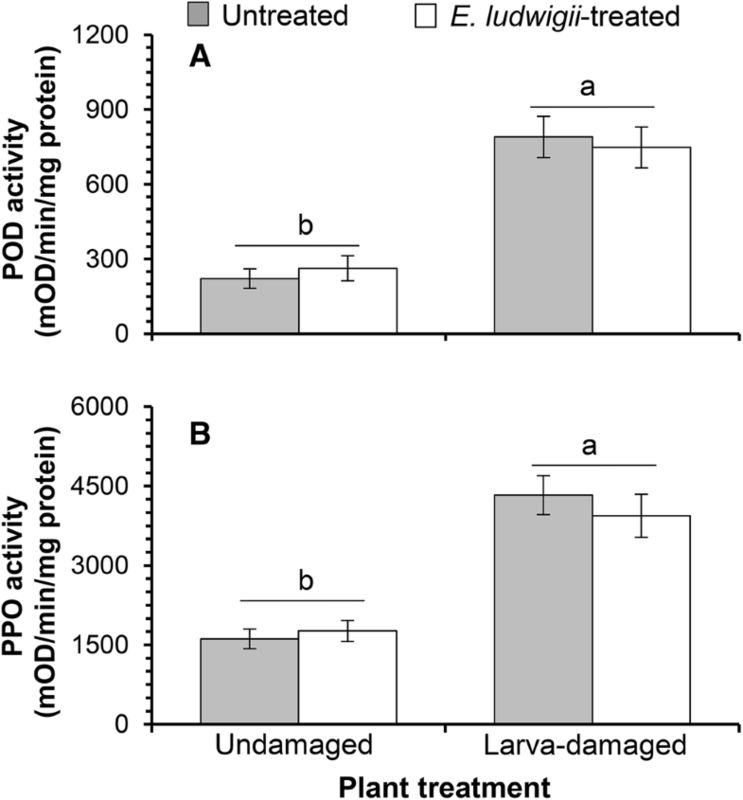 Helicoverpa zea feeding damage induced significantly higher POD (Fig. 5A; F1,101 = 47.33, P = 0.0001) and PPO (Fig. 5B; F1,101 = 69.69, P = 0.0001) activities. Treatment of plants with E. ludwigii did not influence enzyme activities in damaged or undamaged plants (POD: F1,101 = 0, P = 0.945; PPO: F1,101 = 0.13, P = 0.7230). H. zea larvae that fed for 5 days on excised tomato leaves that were previously damaged by H. zea larvae exhibited significantly lower weight (Fig. 6A; F1,104 = 6.3, P = 0.0140) and higher mortality (Fig. 6B; F1,104 = 14.55, P = 0.0010) than larvae fed on undamaged tomato leaves. 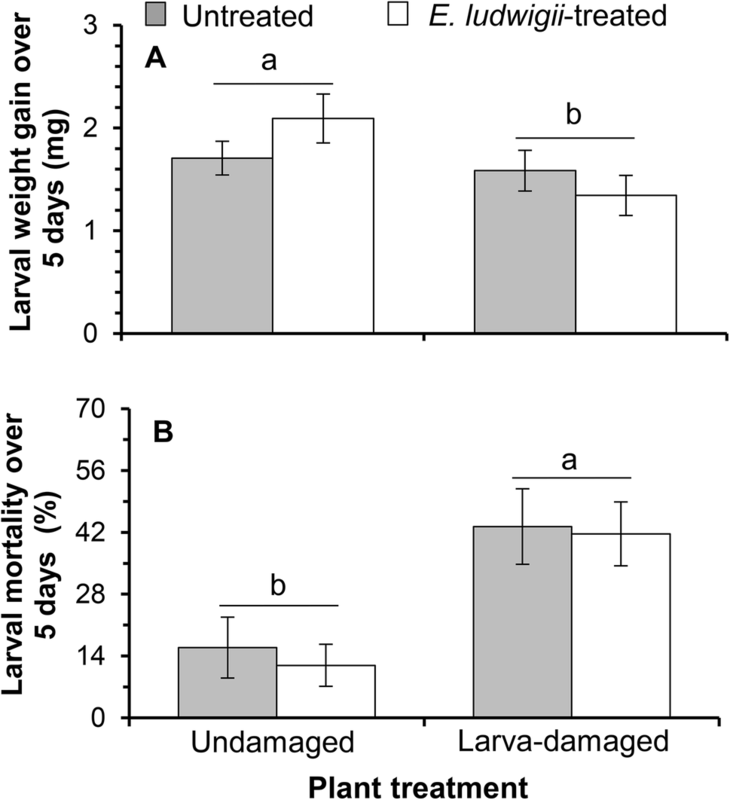 Treatment of plants with E. ludwigii had no significant effect on larval weight (Fig. 6A; F1,104 = 0.22, P = 0.6380) or mortality (Fig. 6B; F1,104 = 0.13, P = 0.7210). There were no significant interactions between bacteria and induction treatments. PGPB are beneficial for plants in many ways (Bashan and de-Bashan 2005; Vessey 2003) and have been widely used in the field as bio-fertilizers in sustainable agricultural systems (Bhardwaj et al. 2014). Here, our results demonstrate that tomato plants treated with E. ludwigii, which was isolated from the regurgitant of tomato fruitworm larvae, exhibited significantly enhanced growth rates and reproductive output. These findings suggest that our isolate of E. ludwigii can be considered a PGPB. More importantly, from an ecological perspective, our findings suggest that the bacteria deposited by a fruit-feeding insect into the fruit, and consequently on seeds, may benefit the growth and fitness of the plant’s offspring. This highlights complex interactions between plants, their herbivores and microbes. Interestingly, the length of roots, which were significantly longer in E. ludwigii-treated plants at 11 days post germination, were not significantly different from untreated plants at 25 days post germination. However, the roots of E. ludwigii-treated plants at both 11 and 25 days post germination were heavier than the roots of untreated plants, either from thicker roots or greater root branching, indicating a stronger root system. Studies suggest that endogenous application of auxin helps increase the structure of the plant root system (Perez-Torres et al. 2008). Many plant-beneficial bacteria are able to increase the plant’s uptake of nutrients, such as N, P, and K, by synthesizing natural auxin, indole-3-ethanol or indole-3-acetic acid (IAA) (Patten and Glick 1996), which can then stimulate root systems and plant growth (Hayat et al. 2010). IAA can be found throughout the body of the plant (Shoebitz et al. 2009). Even though our E. ludwigii strain enhanced tomato plant growth rate, and hence yield, there was no cost to the plant in terms of the anti-herbivore defenses we measured (i.e., no growth-defense trade-off). It is well known that PPO and POD are important plant oxidative enzymes against herbivores by reducing their nutrients digestibility (Felton et al. 1989, 1992). Megali et al. (2014) previously showed that inoculation of tomato plants with a concoction of beneficial microorganisms enhanced plant yield but significantly reduced the concentration of jasmonic acid in leaves against Egyptian cotton leafworms (Spodoptera littoralis). In some studies, beneficial soil microorganisms have been shown to enhance plant defenses. For example, inoculation of Arabidopsis plants with PGPB increased the tissue concentrations of glucosinolates, which provided greater protection against insect herbivores (Aziz et al. 2016; Pangesti et al. 2016). Thus, the PGPB-mediated growth promotion in plants can have negative or positive effects on plant defenses, depending on PGPB species. Importantly, our results suggest that our E. ludwigii strain has the potential to be used for plant growth-promotion without increasing the need for chemical or biological pest control. 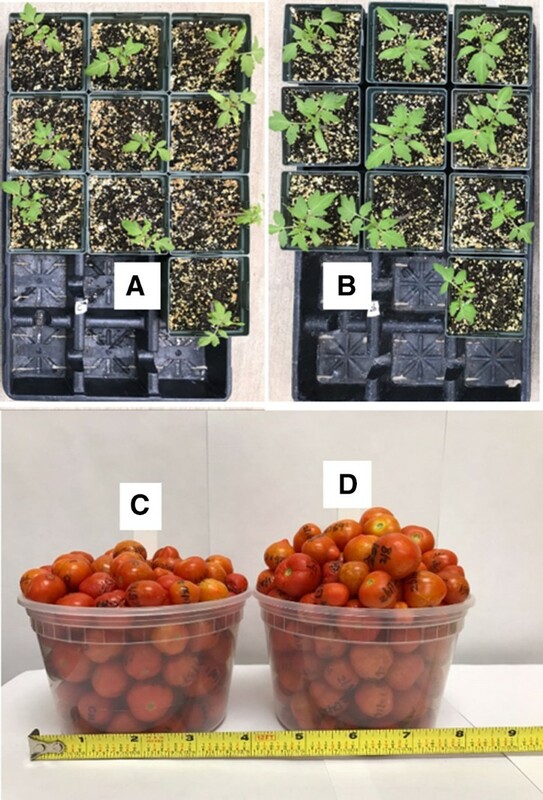 To conclude, inoculation of germinated tomato seeds with bacteria isolated from an herbivore’s gut enhanced plant growth rate, protein content and fruit yield, without compromising anti-herbivore defenses of the plants. The potential role of insect-associated bacteria in stimulating plant fitness has only recently gained attention. Therefore, further studies will examine other microbial inhabitants of herbivore guts to influence plant growth, and their potential roles in ecological interactions and use as bio-fertilizers. We will also examine the ability of E. ludwigii to enhance the growth of other agriculturally valuable crop species. Understanding the complex interactions between microbes, plants and herbivores will be important in identifying bio-fertilizers that not only enhance plant growth, but also maximize agricultural production by maintaining or improving plant resistance against herbivores and diseases. Using microbes that are relevant (i.e., naturally present) in a specific agroecosystem could improve the effectiveness of bio-fertilizers in sustainable agricultural systems. This work was supported by the United States Department of Agriculture (Agriculture and Food Research Initiative Grant 2017-67013-26596). The China Scholarship Council (Grant 201506300111) provided financial support to Qinjian Pan. A Natural Sciences and Engineering Research Council of Canada Postdoctoral Fellowship (NSERC PDF-488105-2016) provided financial support to Ikkei Shikano. The authors greatly appreciate Dr. Jie Wang for providing the bacterial strain used in this study. We appreciate the suggestions and discussions of Lin Chen in the preparation of this manuscript. We thank Michelle Peiffer for her technical assistance and suggestions. We would also like to thank Dr. Dawn Luthe (Department of Plant Science, Pennsylvania State University) for sharing her laboratory equipment.